The Plant Protection Institute was founded in 1880 (Phylloxera Research Station). It is a grant-aided, non-profit institution operating under the Hungarian Academy of Sciences (HAS) since 1982. In 2012 it became the part of the newly formed Centre for Agricultural Research of the Hungarian Academy of Sciences. The Plant Protection Institute (PPI CAR HAS) is the only institution in Hungary devoted entirely to plant protection research covering all aspects of this discipline, e.g. biology of pathogens, pests and weeds, physiology and biochemistry of plant resistance to diseases and abiotic stress factors, interactions between pathogens or pests and their natural antagonists and the potential of biocontrol. 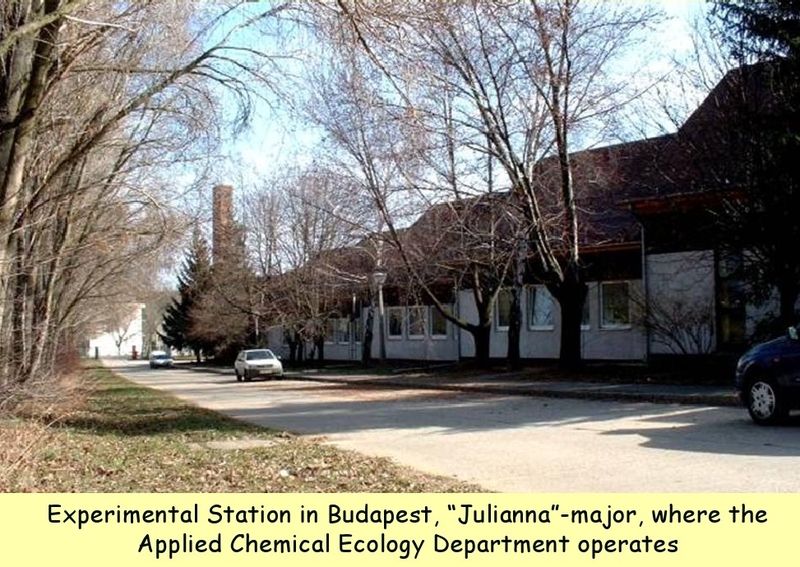 Chemical ecology research in Hungary was started at the Zoology Department of the Institute in the middle of the seventies. Based on our basic research results in 1993 the CSALOMON® pheromone trap family was started to assist growers inside and outside of Hungary. Traps of our trap family (together with exhaustive advisory material concerning the use of pheromone traps in general, and the respective insect species in particular) are offered to growers through the non-profit extension service of our Institute. Income from selling traps goes into the budget of the institute and will contribute to the financial support of the basic research activities of our team. During the past decades we managed to acquire and set up special methods and equipment (several of which oprerates uniquely in our institute in Hungary) necessary for the research on semiochemicals and pheromones. Our scientists participated in the elucidation of pheromone and semiochemical structures of several dozens of moths, beetles and other insects. In most of these species an insect-tailored trap-bait system capable of highly sensitive detection and trapping of the given taxon was developed. At present (2013) we offer traps and lures for more than 100 pest insects (pls refer to the current List of Products downloadable from this homepage). At present (2013) CSALOMON® activities are organized within the auspices of the Applied Chemical Ecology Department (crew includes two postdocs, two PhD students, six technical assistants, and, last but not least, the head of department). We continue our basic research efforts to discover new pheromones and to develop new semiochemical products, which, we trust, will assist growers and the propagation of environmentally safer agriculture in general all over the world. Jermy, T., Szentesi, Á., Tóth, M., Szőcs, G. 2006. Pest control: from chemical ecology to evolution. A Hungarian perspective. Acta Phytopath. Entomol. Hung. 41:121-135.